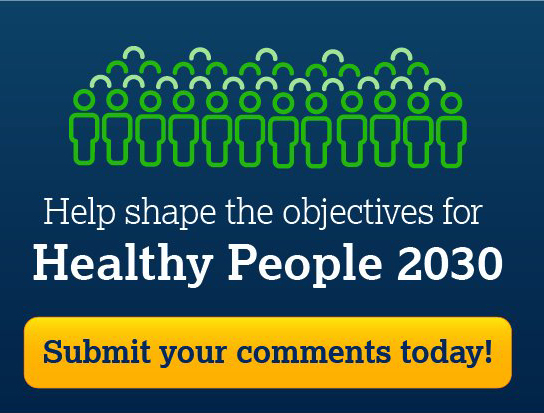 The U.S. Department of Health and Human Services (HHS) is soliciting written comments on the proposed objectives for Healthy People 2030 through January 17, 2019. This public comment period will allow comments on the proposed HP2030 objectives and members of the public can also propose their own objectives. The proposed core objectives for HP2030 [PDF, 455KB] include objectives for HIV and viral hepatitis (the latter are listed under the "Immunization and Infectious Disease" category). There are also proposed objectives for a host of issues related to our national responses to HIV and viral hepatitis including adolescent health, family planning, LGBT health, STDs, social determinants of health, mental health, and substance use and opioids. Every decade, the Healthy People initiative develops a new set of science-based, 10-year national objectives with the goal of improving the health of all Americans. The development of Healthy People 2030 includes establishing a framework for the initiative—the vision, mission, foundational principles, plan of action, and overarching goals—and identifying new objectives. In response to stakeholder input, Healthy People 2030 will be a streamlined set of national health objectives [PDF, 108KB] guiding the Nation in efforts to improve health. Healthy People 2030 will continue to represent critical public health priorities by addressing the leading causes of morbidity and mortality and driving action at the national, state, and local levels.